Butter chicken or murgh makhani (Hindi: मुर्ग़ मक्खनी) (pronounced [mʊrg məkʰaːniː]) is an Indian dish of chicken in a mildly spiced curry sauce. It is served in India and abroad. 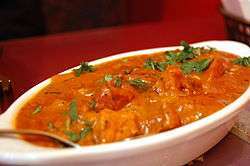 The dish has its roots in Punjabi cuisine and was developed by the Moti Mahal restaurant in Delhi, India. Chicken is marinated for several hours in a cream and spice mixture. The spices may include garam masala, ginger, garlic, lemon or lime, pepper, coriander, cumin, turmeric and chili. 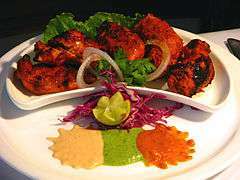 The chicken is usually cooked in a tandoor (traditional clay oven), but may be grilled, roasted, or pan fried. It is served in a mild curry sauce that includes butter. There are many variations on the composition and spicing of the sauce. Spices may include asafoetida, cumin, cloves, cinnamon, coriander, pepper and fenugreek (Punjabi/Hindi: kasuri methi). Cream may be used in the sauce or as a garnish. Cashew paste may be used as a thickener. Garnishes can include butter, cream, green chillies, coriander, and fenugreek. Kundan lal Gujral, the owner of Moti Mahal Delux, a restaurant in Delhi, is often credited as the creator of butter chicken. ↑ Soofi, Mayank Austen. "Delhi's original butter chicken". Hindustan Times. 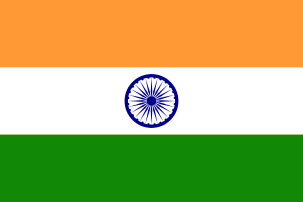 HT Media Ltd. Retrieved 14 June 2015. ↑ "Moti Mahal: Delhi's Gastronomic Pearl – The Wall Street Journal". Retrieved 15 November 2014.